Is A 'Fiscal Cliff' Deal Near? : The Two-Way Some signs are pointing to an agreement being reached soon to avoid the automatic tax hikes and spending cuts. Of course, President Obama and House Speaker John Boehner have tried to strike a "grand bargain" before, only to have it fall apart. Is A 'Fiscal Cliff' Deal Near? President Obama and House Speaker John Boehner, R-Ohio, at the White House last month. The two sides have "moved close to agreement." Whichever way you put it, the stories this morning about talks to avoid going over the so-called fiscal cliff of year-end tax increases and automatic spending cuts all seem to be saying that President Obama and House Speaker John Boehner, R-Ohio, are within reach of a deal. -- "Boehner offered to let tax rates rise for income over $1 million. The White House wanted to let tax rates rise for income over $250,000. The compromise will likely be somewhere in between." -- "On the spending side, the Democrats' headline concession will be accepting chained-CPI, which is to say, accepting a cut to Social Security benefits." Of course, we've seen the president and House speaker come close to striking a "grand bargain" before, only to see the deal fall apart. Update at 11:35 a.m. ET. White House Says GOP's "Plan B" Won't Work. "The president has put a balanced, reasonable proposal on the table that achieves significant deficit reduction and reflects real compromise by meeting the Republicans halfway on revenue and more than halfway on spending from where each side started. That is the essence of compromise. "The parameters of a deal are clear, and the president is willing to continue to work with Republicans to reach a bipartisan solution that averts the fiscal cliff, protects the middle class, helps the economy, and puts our nation on a fiscally sustainable path. But he is not willing to accept a deal that doesn't ask enough of the very wealthiest in taxes and instead shifts the burden to the middle class and seniors. The speaker's 'Plan B' approach doesn't meet this test because it can't pass the Senate and therefore will not protect middle class families, and does little to address our fiscal challenges with zero spending cuts. The president is hopeful that both sides can work out remaining differences and reach a solution so we don't miss the opportunity in front of us today." Speaking to reporters a few minutes ago, Boehner said the president has proposed $1.3 trillion in new revenues, but "only $850 billion in net spending reductions." 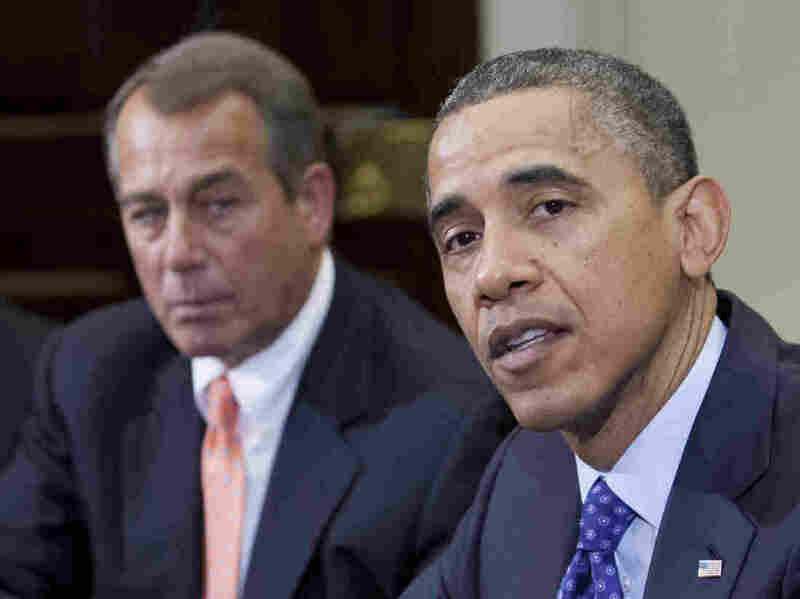 The president, Boehner said, "isn't there yet" when it comes to a "balanced" plan. So, while talks continue, Republicans are drafting a "plan B," the speaker said. It would "protect American taxpayers who make $1 million [a year] or less and have all their current [tax] rates extended." That, he added, is "the right course of action for us."